As a local Sedona girl, Cindy has been living the Sedona lifestyle since the age of three! She has thoroughly enjoyed countless hours of hiking, biking, and horseback riding through Sedona's gorgeous red rock formations. The diverse temperature offered within 45 minutes in any direction from Sedona enables her to savor these sports almost year round. The multifariousness of activities within a 3-hour radius is endless, and that is why Cindy continues to enjoy the incredible natural surroundings of the Verde Valley since 1965. Her entrance into the real estate world was second nature as she would locate the lots to their build speculation homes upon, back in the 80's. That led to her getting her real estate license to serve the public in 1989. In 1995, she obtained her broker's license along with other designations to help protect her clientele. Cindy remains connected with the tradesmen in the area and has a huge contact base. About sixty percent of her business comes from referrals from other satisfied clients and professionals; which speaks volumes for the service you can expect to receive. A list of references is available upon request. 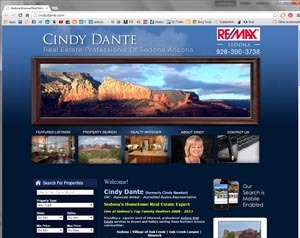 She has now joined forces with another powerhouse agent, Brian Dante, who came to Sedona in 1994. Brian has been a top producing agent for Century 21 in California since he became licensed in 1979 and had earned the #1 agent in Arizona designation for Re/Max. Together they continue to be among the top real estate agents in Sedona. Out of over 600+ real estate agents in the Sedona Verde Valley Association of Realtors, they have continuously been listed in the top 20 agents since 2008. Why? Commitment; this is their full-time profession; there is nothing part-time about their dedication to serving their client's real estate needs. It's a personal service ethic and pledge to integrity; honed over six decades and thousands of transactions that make them the right real estate agent for you. Their accumulated knowledge and experience is your best friend during the Real Estate Transaction; using the latest technology in their dealings to ensure a smooth process. Most importantly, Brian and Cindy listen to their clients, so they can exceed their clients’ expectations, from start to finish and long after the completion of the transaction. When it's time to buy or sell. . . You can count on them.